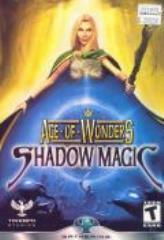 Age of Wonders : Shadow Magic is a stand alone sequel to Age of Wonders 2. As the other AoW games, it's all about turn based strategy in a fantasy world. In the campaign, a corrupt new empire led by the wizard Phobius, has launched an aggressive assault on the ancient races and all things magic. Meanwhile, an even greater evil in the form of hellish demons, breeds within its shadows. The wizard Merlin has been captured by the demons, but can still communicate with his old wizard friends. You play these wizards as they fight the human empire and the demons. The main character is the Wizard, who most of the time stays in his wizard tower casting spells in his domain. The wizard researches new spells and abilities and becomes more and more powerful as the game moves on. One unique feature is the Simultaneous turns mode, where all players move their units at the same time. For those that like it old-school there's still a Classic turns mode. • One new unit for each race, and all the old units has been balanced to make the races more equal. • A third level, the Shadow world.